Indonesia is the largest archipelagic country in the world, consists of 17,508 small and big islands, with a total area of 1,919,440 sq km, consists of water area = 93,000 sq km (not included exclusive economic zone: 200 nautical miles, and land area = 1,826,440 sq km with its coast line = 54,716 km. Straddles equator, strategic location astride or along major sea lanes from Indian Ocean to Pacific Ocean. Population = 231,328,092 (July 2002 est.). Arable land = 9.9%, permanent crops = 7.2%, others = 82.9%. Land use: cultivable regions = 123,432,164 ha (consists of forests = 57.74% and non-forest = 42.26%); sheltered regions = 67,491,646 ha (consists of forest = 81.56% and non-forest = 18.44%). Indonesia was colonized by the Dutch in early seventeen century to mid nineteen century and achieved its independence in 17 August 1945 (proclamation of independence). Authoritarian regimes: from 1945 – 1965 was under the President’s Soekarno administration, from 1966 – 1998 was under the President’s Soeharto’s administration. Democratic regimes: 1998 – 1999 was under the President’s Habibie administration, 1999 – 2001 was under the President’s Abdulrachman Wachid’s (Gus Dur) administration, and now since 23 July 2001 is under the President Megawati Soekarnoputri’s administration. The president is both the chief of state and head of government (cabinet appointed by the president). Formerly, president and vice president elected separately by the People’s Consultative Assembly (MPR) for five-year terms, but in the next 2004 national election (in accordance with UUD 1945 constitutional changes), the election of the president and vice president will be direct vote of the citizenry. The People’s Consultative Assembly (MPR) includes the House of Representative (DPR) plus indirectly selected members meets every five year to (formerly) elect the president and vice president, to approve broad outlines of national policy (GBHN), and also has yearly meetings to consider constitutional and legislative changes. Indonesia has 27 provinces, 2 special regions (Yogyakarta and Aceh), and 1 special capital city district (Jakarta) with 370 regencies and municipalities. Cadastre in Indonesia is legal cadastre (conducted by the National Land Agency: BPN) with negative system within the registration of titles system, and fiscal cadastre (conducted by the Directorate of Land and Building Taxation: PBB, Department of Finance) for only the taxation purposes. Partners for the BPN are the Land Deeds Officials (PPAT) who issued the land deeds (transfer and mortgage) for land registration and the Licensed Surveyors for surveying and mapping the land parcels in accordance with the government surveyors. Certificate of land titles are issued by the Land Offices and they are valid as the strong evidence. “BPN is to assist the President in developing and managing land administration, based on the Basic Agrarian Law and other related laws and regulations that include regulating land use, land holding, and land ownership, land titling services, land surveying and land registration, and other activities related to land issues based on the President’s policy”. Most of cadastral surveys are undertaken by the government surveyors within the BPN. Since the introduction of Government Regulation NO. 24 Year 1997, the role of private surveyors have been taken part, both the Surveying and Mapping Companies and the Licensed Surveyors. The Land Deeds Officials (PPAT) has also taken parts on the land registration processes. Land registration in Indonesia is conducted based on the Article 19 Law No. 5 Year 1960 (UUPA) and Government Regulation No. 24 Year 1997. The specific regulation identifies guidelines for licensing and registration of private cadastral surveyors and the undertaking of cadastral survey by the private sectors is the State Ministry of Agrarian Affairs/Head of BPN Regulation No. 2 Year 1998. Surveying programs are offered at two state universities and one private university, but for the spatial information programs are more widespread offered at many state and private universities especially in Java Island. As stated in Article 19 BAL (UUPA), to guarantee the juridical assurance of land ownerships, the government conducts the land registration that covers all the regions of the Republic on Indonesia that consists of (a) surveying, mapping, and booking the lands; (b) registration of titles and transfers of those titles; (c) issuing the letter of evidence of land title that acknowledge as the strong evidence. Afterwards, based on the Government Regulation No. 24 Year 1997, the of land registration is defined as “the sequence activities conducted by the government continuously and regularly, consist of physical and legal data acquisition, processing, registration, representation, and maintenance, in forms of maps and registers of land parcels and strata title units, and issues the certificate of titles and encumbrances. The cadastral system adopted in Indonesia is a registration of titles with the negative system. As it is stated in Article 19 BAL, the certificate of land title is valid as the strong (not positive or absolute) evidence. As long as it is otherwise inversely proven by the court, then the certificate of land title is the strongest evidence. The number of land parcels registered and titled is 24.5 million land parcels out of the number of 84.5 million land parcels all over the Indonesian territory (including forest areas). Among the 24.5 million land parcels, they are still paper based maps and databases (non digitized) and also still broadly loosely-connected each other. 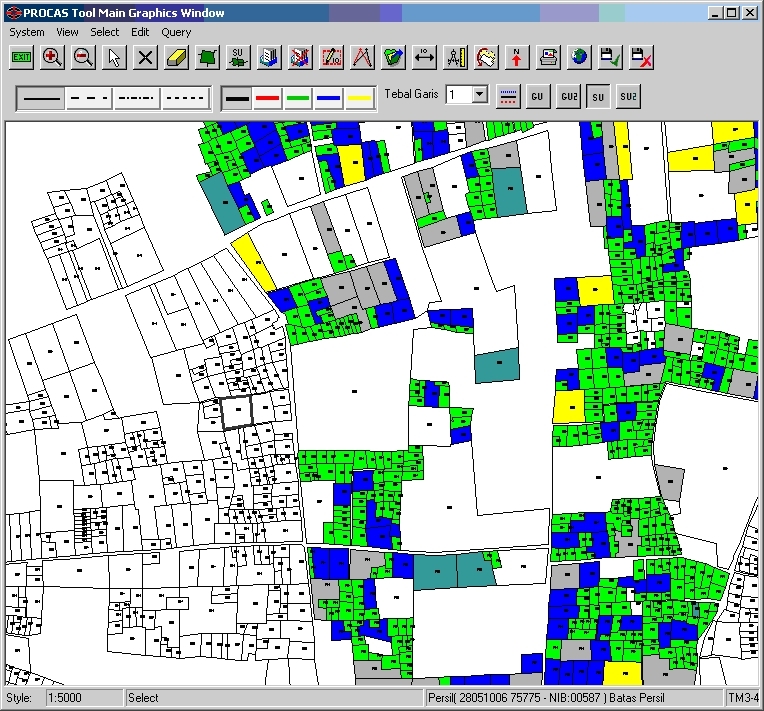 Spatial components: the cadastral maps show all land parcels graphically corresponding to the registered title (textual and juridical components) with unique parcel identifiers (NIB) and number of map sheets. Juridical data: the land register identifies land parcel data and information which includes owners’ rights, restrictions, durations, responsibilities, kinds of legal documents and legal proofs, and other legal related data. Cadastral maps in Indonesia is basically drawn on to three scale, 1:1,000 (the most common scale), 1:500 (for the dense urban areas), and 1:2,500 (for rural areas). 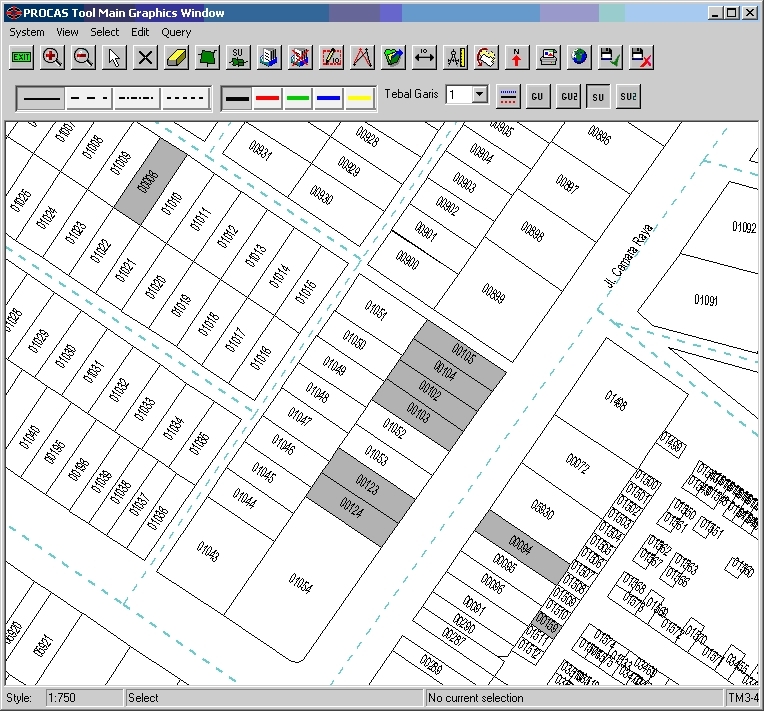 Especially for plantation estate, the cadastral map uses the 1:5,000 or 1:10,000 scales. Fig. 1: City of Tangerang (survey accurate). Here are two examples of the different digital cadastral databases from City of Tangerang and Regency of Tangerang. Fig. 2: Regency of Tangerang – rural areas (survey accurate). Today, cadastral maps are still mainly used for the BPN purposes, although they may also be used by other government institutions and local government, it is not very frequent, one of some reasons, because they have not been digitized yet. Lack of cadastral (tangible and intangible) infrastructures i.e. : maps, aerial photos/satellite images, cadastral networks, surveying instruments, computer assisted mapping, and inadequate land and cadastral laws and regulations. Reforming land and cadastral laws and regulations.